The varied and deep injustices that plague our country exist because they are actively supported by one section of the population and tolerated by a much larger passive section of the population. And until now those who actively oppose these injustices have lacked the strength to effect real and permanent change. The elite that have hijacked both states in this country understand the importance of media control and manipulation in the battle for the hearts and minds of the Irish people. They understand that people form their opinions on the basis of the information that is presented to them. If one can control the nature or flow of that information, or if one can manipulate and colour that information it is possible to effectively shape the opinions that people form. And by extensions the actions that they take. To this end the state and private media on both sides of the border produce a never-ending diet of pro-establishment drivel. Talking head after talking head regurgitating the same tired old right-wing message. Generation after generation of politicians, journalists, economists and various other ‘opinion-makers’ echoing the group think of the ruling class. Dissenting voices are virtually never heard. Think about it. Can you name five genuinely left-wing journalists or broadcasters that are in regular employment in any significant print or media outlet? Can you name even one? Come to think of it how often do you even hear a working class accent on the radio or TV? And when you do it’s invariably to reinforce one stereotype or another. There is no ‘free media’ in Ireland, unless you are the likes of Tony O’Reilly or Denis O’Brien. What we have is an elaborate facade of media freedom. Granting the occasional two minute sound-bite to some progressive individual or other, whilst the supporters of the political establishment dominate the remaining twenty-three hours and fifty-eight minutes does not constitute a balanced or ‘free media’. Understanding the nature of the media in Ireland will become critically important in the coming weeks and months as the battle against the Water Tax and the wider austerity programme intensifies. You can put the kettle on for the smear and black propaganda campaigns that will be launched to first divide, and then conquer the people power that is now on the streets. There will be many lines of attack as the establishment seek to create many fissures within the anti-Water Tax movement. One line of attack will, without doubt, focus on the fact that republicans are part of a mass movement that encompasses hundreds of thousands of citizens. We republicans aren’t actually members of the community you understand - in fact we’re barely people at all. We in eirigi are all too used to being portrayed as the bogeyman ‘dissidents’ to be feared and reviled in equal measure. In 2006 when we answered the call for support from members of the local community to blockade Shell’s refinery in Mayo the Independent newsgroup accused us of being ‘outsiders’ who were ‘hijacking’ the protests. Nothing to do with the fact that we were loudly challenging the reality that private energy companies stood to make billions of euros from Ireland’s oil and gas reserves - your oil and gas reserves. Nothing to do with the fact that Tony O’Reilly, the then owner of Independent newsgroup, also owned the oil and gas exploration company Providence Resources. Of course not. In 2010 we, with others, organised a series of events to highlight the perverse level of economic and political power enjoyed by the richest 1% of the population. 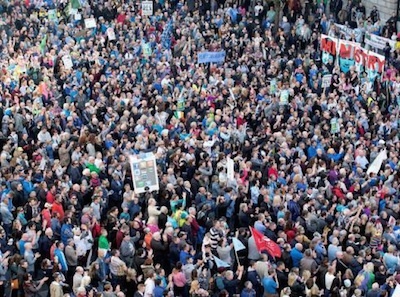 When we organised protests outside the Shrewsbury Road (occasional) home of Denis O’Brien and Tony O’Reilly’s Merrion Square mansion we did so full in the knowledge that we were playing outside the rules of ‘acceptable’ protest - ‘acceptable’ to those who control the private media that is. And now as we stand with our fellow citizens to prevent the private takeover of another one of Ireland’s natural resources we find ourselves demonised and ridiculed in media outlets controlled by Denis O’Brien. The usual mud is being thrown accusing eirigi of being a ‘rent-a-mob’, of ‘hijacking protests’, of being ‘trouble makers intent on infiltrating protests’ and so on and on and on. Since 2006 our activists have consistently challenged the ruling elite that control the Six and Twenty-Six County states. When the Celtic Tiger was still roaring we were doing our bit to highlight the deeply unjust nature of Irish society. For the last eight years we have been calling for a popular movement to overthrow the ruling elite that have corrupted and poisoned our country. We don’t state these facts in search of praise, but to highlight our experience of how the political establishment and media respond to those who will not allow themselves to be intimidated or bought off. The political and economic elite that have inflicted six years of austerity and decades of exploitation on the population fear the potential of the anti-Water Tax movement. They fear that a defeat of the Water Tax will unleash forces that they cannot control. They fear that those who have passively tolerated the status quo will now move to actively oppose it. They fear that a victory for the anti-Water Tax movement will embolden the demands and ambitions of the working class. The battle for the hearts and minds of the people is set to dramatically intensify as the political landscape continues to rapidly evolve. And when the attempts to divide and conquer the anti-Water Tax movement begin in earnest it must be hoped that we will all have the good sense to remain united in the interests of a victory for the working class.